Why is Desktop Manufacturing Important for the Osmotic Innovator? In recent months there have been increasing mentions of the concept of “desktop manufacturing” in both technical and lay press. 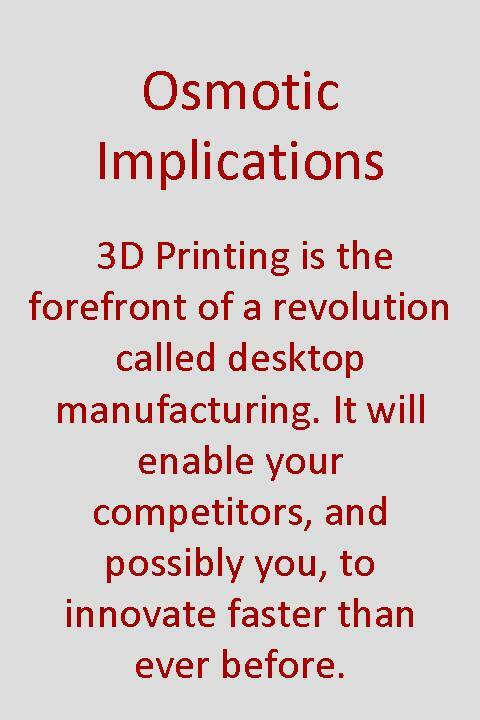 “Desktop manufacturing” refers to the use of 3D Printing technologies to generate products using designs developed on or delivered to a user’s computer. This revolution has been coming for some time; with Fast Company stating that “the end of the current production- manufacturing economic model may be on the horizon” back in 2009. In a keynote at the FEI 2012 conference Chris Anderson of Wired magazine spoke on the new business models that these technologies are enabling –enthralling the audience with stories of successful application of the technology. Anderson went so far as to say we are only at the dot-matrix stage of this technology, with massive growth and development poised to occur. Indeed, increasingly advanced 3D printers and the computer-aided design (CAD) programs that support them are being made available at lower and lower prices to small companies that rent time and capacity to other companies and to individual consumers with the interest. But why should this topic be important to the Osmotic Innovator? – Rapid Prototyping: the ability to quickly turn-around prototype products should not be underestimated. Only 10 years ago prototypes were used sparingly due to cost and time to manufacture, limiting consumer interactions with test concept designs to 2D images and descriptions. Even today many large companies have their own 3D printing capacity to churn out test designs quickly. The 3D printers of tomorrow may be simple enough to allow product developers with no design experience to create and modify innovative new solutions early in the process. It appears inevitable that the 3D printers of tomorrow will be capable of handling multiple materials to create complex mechanical objects. Making efficient use of these systems has the potential to transform the product development process even further. – Do-It-Yourself Mentality: the students of today (as well as many of the tinkerers) are beginning to see this technology as a normal part of doing business. Whereas teams that want to have the capability to model and create products on the fly currently need to staff individuals with design competency and engineering backgrounds the skills needed to use these tools are increasingly part of a basic technical education. Workshops that allow creative people to access these tools in their free time are also democratizing the product development process, making it possible that competition (or opportunity) for your company is going to come from unanticipated sources in the future. Your best customers might become your worst competition as they are able to harness this technology to make their own product improvements. Having a strategy to harness this technology and those with the skills appropriately will part of doing business in the future. – Future Technologies / Business Models: just as desktop publishing transformed the creation and distribution of printed content innovators should be ready for desktop manufacturing to have a similar impact on the creation, manufacturing, and distribution of new products. How your company will respond to, or position itself within these changes will go far to determining its future. Regardless of your experiences with desktop manufacturing in the past, it is clear it is a concept that is poised to transform a multitude of industries. As an Osmotic Innovator there are a number of opportunities that can be leveraged to boost your teams’ effectiveness. Are you ready to seize the chance before your competitors do? This entry was posted in Innovation challenges, Resources, Technology, Thinking and tagged ideation, product development processes, prototyping, start-ups.